Loehle: Vindication | Wott's Up With That? “Loehle: Vindication“. Craig Loehle uses Anthony Watts’ blog to declare “victory!” over criticisms of his 2008 temperature reconstruction, which claimed to overthrow Mann’s “hockey-stick” reconstruction, in the discredited journal Energy & Environment (A 2000 Year Global Temperature Reconstruction based on Non-Treering Proxy Data). At the same time, I have been repeatedly insulted about it on the web. It is claimed that it has been debunked, is junk, that E&E is not a “real” journal, that I’m a hack, that I “only” used 18 series (though 2 were composites covering China & North America), etc. In the ClimateGate emails, Mann called it “awful” (which I’ll take as a compliment!). Lot’s of fun. In this post I demonstrate perhaps a little vindication. Feel good to get that off your chest Craig? 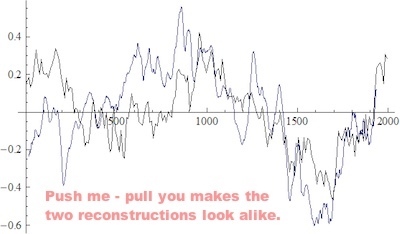 Craig Loehle's misleading comparison of his discredited temperature reconstruction to a new one by Ljungqvist. So was this victory achieved? Apparently through a new paper by Fredrik Ljungqvist called “A new reconstruction of temperature variability in the extra-tropical northern hemisphere during the last two millenia“, in Geografiska Annaler. And all Loehle has to do is cheat the charts a bit! Don’t align over the calibration period, center “on their respective long-term mean values”, ‘warm’ the new reconstruction a bit to get it closer to yours, use non-comparable baselines, and… victory! Our temperature reconstruction agrees well with the reconstructions by Moberg et al. (2005) and Mann et al. (2008) with regard to the amplitude of the variability as well as the timing of warm and cold periods, except for the period c. ad 300–800, despite significant differences in both data coverage and methodology. I guess Loehle and Anthony were too lazy to read the whole thing, even though they pasted it into their article. Is this what passes for “vindication” in denialist circles these days? This entry was posted in Anti-Science, Misdirection, Numbers are Tricky, Pull the Other One and tagged Chart cheating, Gullibility, Misrepresentation, Numbers are Tricky by Ben. Bookmark the permalink. What is it about reading / not reading stuff? I confess I sometimes skip bits-in-the-middle of long, technical papers. But I always, always, always read every word of the conclusions. Well, we all know that in a town called Kyoto, Japan, they have an annual festival based entirely upon flowering cherry blossoms. The records for the wonderful festival extend back as far as 900 AD. A published peer-reviewed science paper by Y. Aono gives us a mean March monthly average temperature circa 1100 AD of around 7 degrees C.
Fast forward to the year 2010, and shock horror the current mean march average temperature, as published by the Japanese Weather Bureau is now 8 degrees C or around 14% warmer. Oops! We also know the MWP is by definition from 950 AD to 1250 AD, courtesy of Hubert Lamb, a point that the majority of incoherent ones routinely ignore. Ouch, no cherry blossoms for Craig then! How odd, Japanese temperature proxies existed and yet were not included in Craig’s paper, most strange indeed. Aah Ben, Anthony and Loehle actually only seem to read and see what they want to. Don’t bother them with the conclusions of the actual paper! Loehle vindicated? Not. Next ‘skeptic’ myth…..